After the experience of her dramatic escape on the eve of the Second World War, which for a long time caused her to reject anything that would remind her of that time, the scholar has now rediscovered and become fond of Austrian literature. In April, Marjorie Perloff received an Honorary Doctorate at the University of Innsbruck. “Over my life time, I have received several prizes and honorary doctorates but this honor bestowed on me by the University of Innsbruck is by far the most important one to me – as I am originally ‘Wienerin’ (Viennese) and Austria is therefore still dear to me. It has been a long time since I last visited Innsbruck and it reminds me of our flight in March 1938,” says Perloff, born Gabriele Mintz. On the day after the Austrian Anschluss (annexation) to Germany, she fled with her parents from Vienna via Innsbruck to Switzerland and later to the United States. “I still remember that we ate sandwiches at a ‘Gasthaus’ or pub next to the police station in Innsbruck – they were delicious,” chuckles the renowned Professor Emerita at Stanford University and the University of Southern California. Until this April she hadn’t come back to this city. She has visited Vienna several times, where, as she puts it, “with growing age” she rediscovered the love for her native country and its literature. “It is too bad that my parents didn’t get to see my emerging interest – I categorically rejected anything Austrian after our escape. I wanted to be completely American,” says Perloff. She also recounts that as a young girl in New York she rebelled against anything German or Austrian and even changed her name Gabriele to Marjorie, the name of one of her class mates. America, or rather Austria? When Marjorie Perloff talks about home, she feels connected to both countries: “Today, I also consider Vienna as home. But my regular day-to-day life is very much American.” During the course of her research, Perloff started studying Ludwig Wittgenstein – also Viennese - and his works in-depth. Her research on the philosopher was the main reason for several invitations to hold lectures in Vienna, which she gladly accepted. “Then I also started taking an interest in Austrian literature. I particularly wanted to study the writers and authors of the interwar period and their literary approach to contemporary issues,” says Perloff. For example, she considers Karl Kraus’ “The Last Days of Mankind” as the most readable work. The translation into English was difficult particularly because of the great number of Viennese dialect expressions. As American scholar with Austrian roots Perloff believes that it is one of her duties to introduce more people in the English speaking world, and particularly in the United States, to the literature so dear to her. “In the United States, hardly anybody talks or knows about Austria and its body of literature. The only well-known authors are Walter Benjamin and Hannah Arendt. It is important to me to introduce the outstanding works of Austrian writers and authors,” says Perloff, who feels closer to the Austrian than the German literature. In her studies of Austrian literature, Perloff is particularly interested in Ludwig Wittgenstein’s works. She calls him the “philosopher of poets” because he concentrated on poetic questions in many of his manuscripts and philosophical investigations. “If the lion could speak, we wouldn’t be able to understand him,” quotes Perloff Ludwig Wittgenstein. “He asked questions about what language is in general and how we are able to communicate and understand each other. I have always been interested in studying languages but even more so in how to understand languages, in particular the language of poetry.” Perloff also analyzes and studies the convergence of different languages and cultures in literature. Especially in political turmoil when people leave their home to flee to another country, there have been direct confrontations between different world views, cultures and languages. Perloff is convinced that in a globalized world the arts and literature may contribute significantly to improve communication and build a more tolerant world. “For me as an emigrant from Vienna, who only rediscovered her roots in her eighties, Wittgenstein’s philosophical remarks and Paul Celan’s and Ernst Jandl’s poems are significant. This is also one reason why I was so excited about this award,” says Perloff, whose roots are in two countries, cultures and languages and who calls herself “originally Wienerin”. 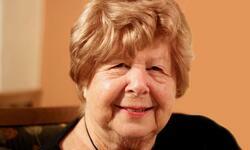 Marjorie Perloff was born Gabriele Mintz into a secularized Jewish family in Vienna in 1931. Her family emigrated in 1938 going via Innsbruck first to Switzerland and then to the United States. She graduated from Barnard College in New York, completed her graduate work in Washington and married medical doctor Joseph K. Perloff in 1953. Perloff moved on to become Professor of English at the University of Maryland, Professor of English and Comparative Literature at the University of Southern California and then Stanford University. She became emeritus in 2001. In April 2016 she received an Honorary Doctorate from the University of Innsbruck. Marjorie Perloff was the first guest professor of the “LFUI (Leopold-Franzens University Innsbruck) – Wittgenstein Guest Professorship Program”. Over the duration of a month, the renowned American poetry scholar and critic lectured in Innsbruck concerning the influence of this well-known philosopher on modernist literature. Ludwig Wittgenstein’s works are relevant for many research fields; the newly established guest professorship is to promote interfaculty and interdisciplinary collaboration as well as international academic discourse and exchange. Within the framework of the “LFUI – Wittgenstein Guest Professorship Program” other experts will be invited over the next few years to add to international research and teaching at the University of Innsbruck.